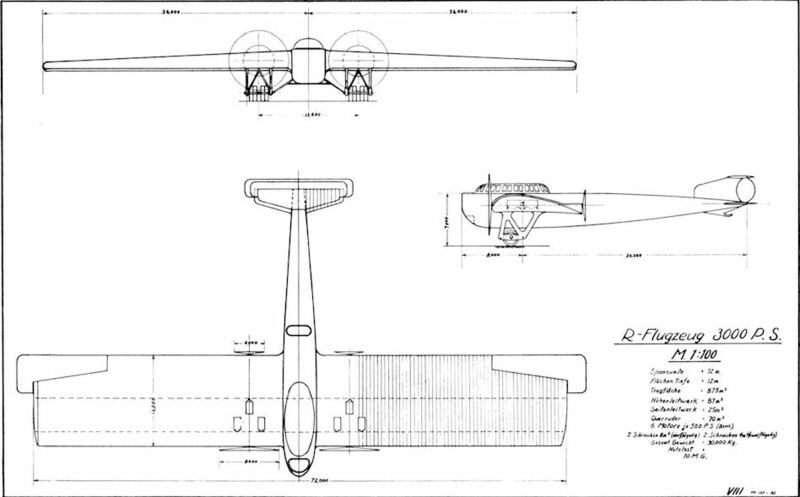 The following ten project drawings of R-planes were discovered among a pile of Zeppelin material that had found its way to the Air Museum at Wright Field. 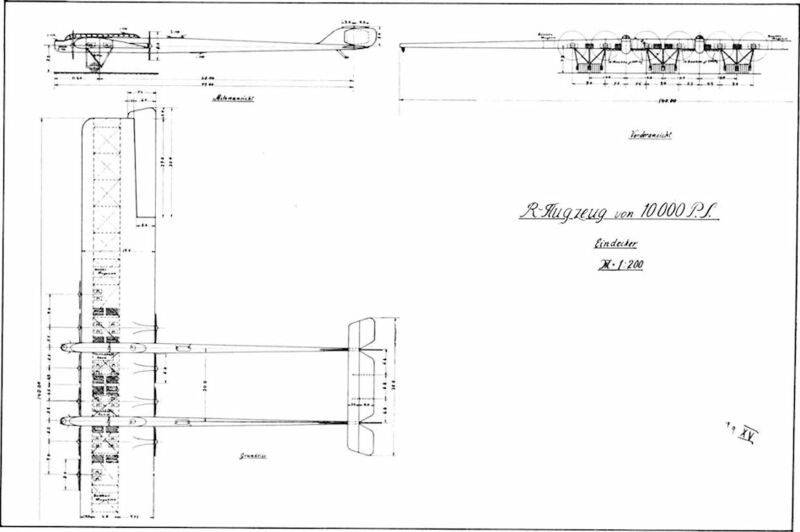 Even by today's standards, the size of some of the projected aircraft is immense, these drawings, more than anything else, reflect the thinking of German aeronautical engineers at the time. Unfortunately no information has been found to throw further light on these extremely interesting drawings. 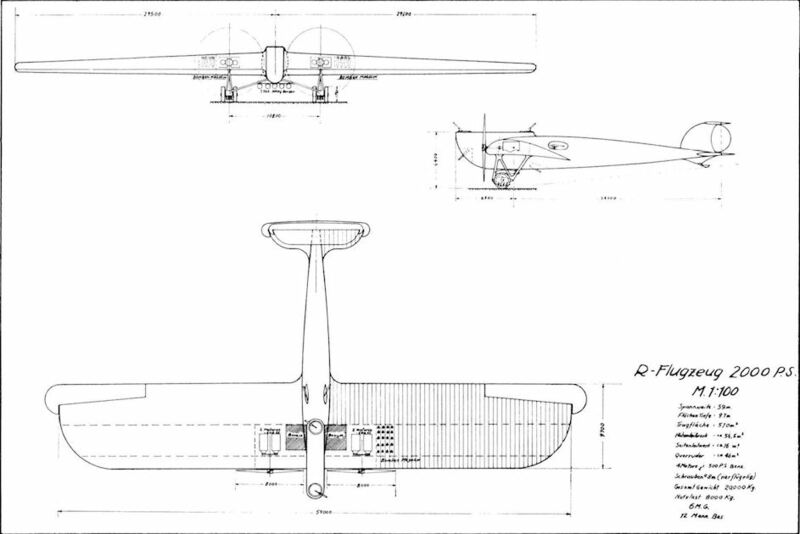 Six of the aircraft depicted follow the same twin fuselage configuration, differing in size and horsepower, and these show a strong resemblance to projected designs published by Junkers in the early 1920s. But the only concrete fact, apart from their existence, is that they originated from Adlershof. Adlershof R-plane project. 4/500 h.p. Benz. Span 48-4 m., length 26 m. 7 mg. 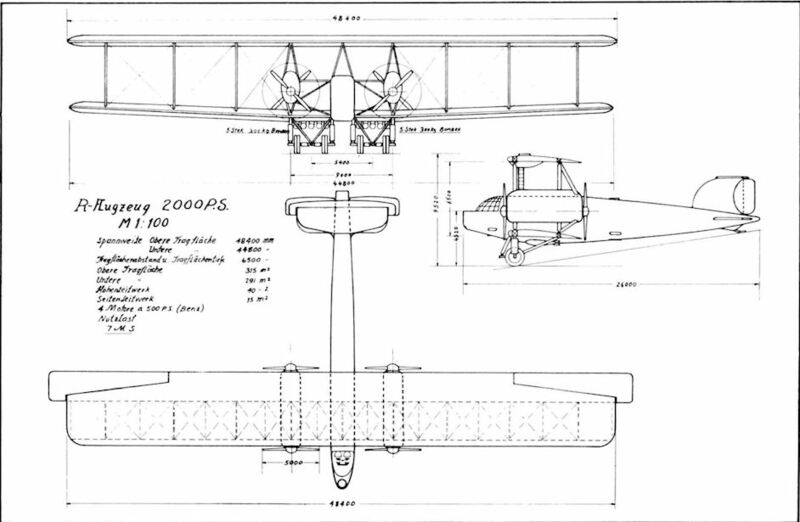 This drawing shows a striking similarity to that of the Neuber project. 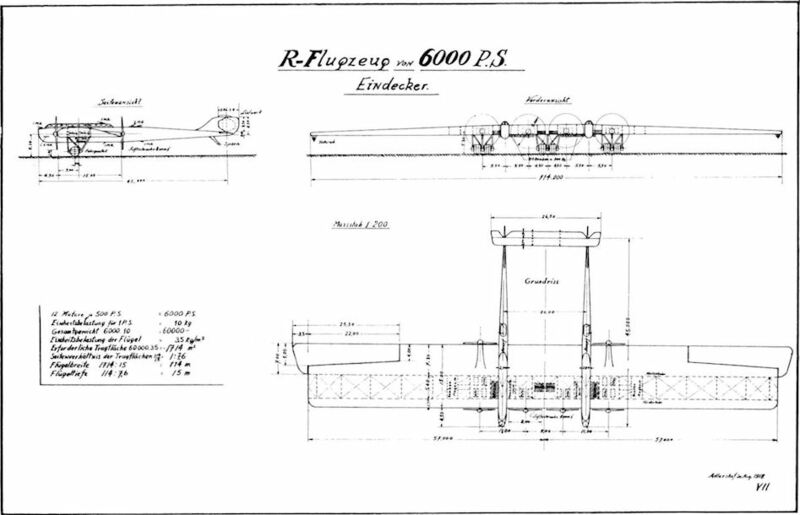 Adlershof R-plane project, dated 7 July 1918. 10/500 h.p. engines. Span 67 m., length 37 m.
Adlershof R-plane project. 4/500 h.p. Benz. Span 59 m., length 30·8 m. 6 mg.
Adlershof R-plane project. 6/500 h.p. Benz. 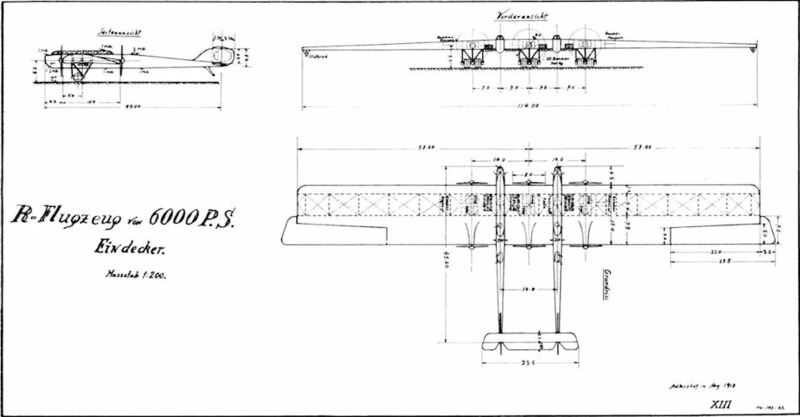 Span 72 m., length 38 m. 10 mg.
Adlershof R-plane project, dated 8 July 1918. 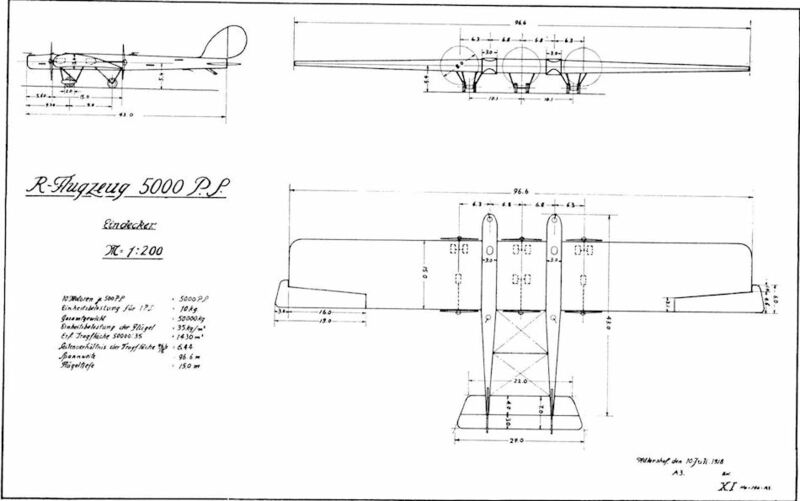 8/500 h.p. engines. 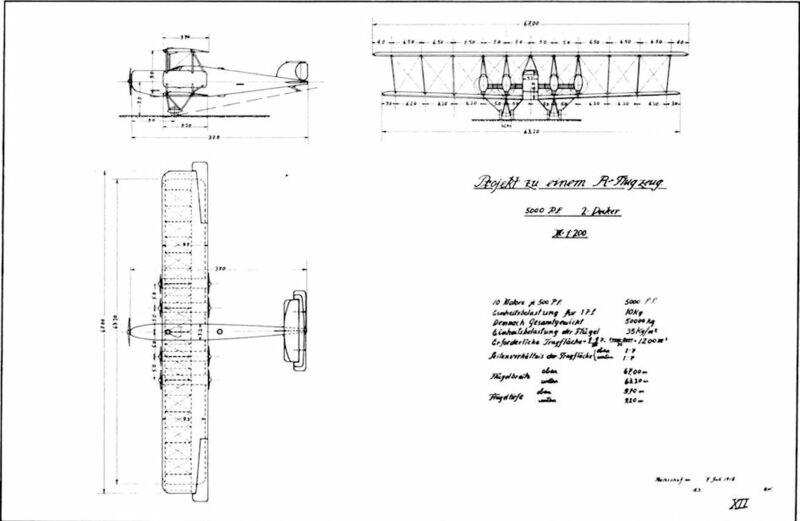 Span 83 m., length 42 m.
Adlershof R-plane project, dated 10 July 1918. 10/500 h.p. engines. 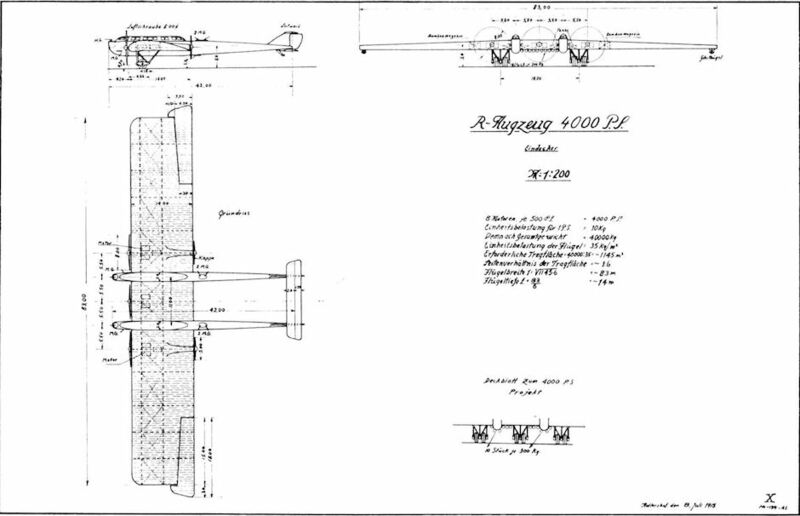 Span 96·6 m.
Adlershof R-plane project, dated August 1918. 12/500 h.p. engines. 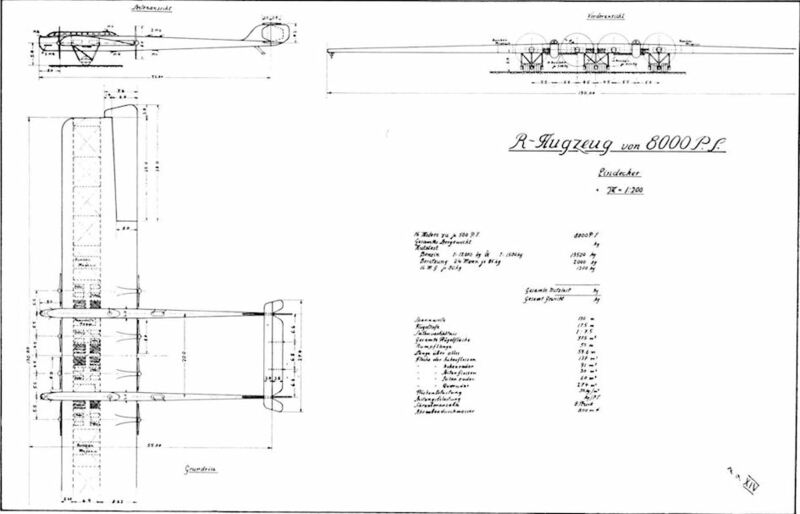 Span 114 m. length 48'36 m.
Adlershof R-plane project, dated August 1918. 12/500 h.p. engines. Span 114 m. length 48 m. This machine differs from that above in having four tractor and two pusher propellers. Adlershof R-plane project. 16/500 h.p. engines. Span 130 m. A twenty-four man crew was planned for this aircraft. Armament comprised 16 machine-guns. Adlershof R-plane project. 20/500 h.p. engines. Span 140 m.